by Nikki Brown, of Crafty Monkey. 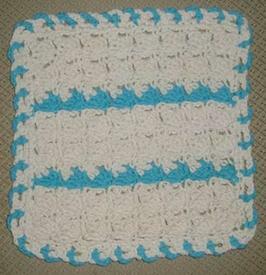 Fancy enough to make as gifts, or to accessorize a guest bathroom, this dancing shells crocheted washcloth is easy to make and both pretty and practical. Row 1- With MC, sc in 2nd ch from hk, ch 2, 4 dc in side of sc just made, sk 3 ch, *sc in next st, ch 2, 4 dc in side of sc just made, sk 3 ch*, rep * to * to end, sc in last st; ch 2, turn. Row 2- *sk dc, dc2tog over next 2 dc, ch 2, sk next dc, sc in top of ch 2*, rep * to * to end; ch 1, turn. Row 3- * sc in sc, ch 2, 4 dc in side of sc just made, sk ch 2 sp*, rep * to * across, ending with sc in top of ch2; ch 2, turn. Rows 4-16- Rep rows 2 and 3, using CC on rows 5 and 11. Do not finish off. Row 1- With MC, ch 1 (counts as beg sc), turn; work 32 sc evenly across top, ch 2 for corner, work 23 sc evenly down side, ch 2 for corner, work 32 sc evenly across bottom lps of beg ch, ch 2 for corner, work 23 sc evenly up last side, ch 2 for last corner, sl st in beg sc. Row 2- Turn, sl st into corner sp, ch 1 (does NOT count as beg sc), sc, ch 4, sk 2 sts, (sc in next st, ch 4, sk 2 sts) around- corner sp counts as 1 st. Fasten off. Row 3- With CC, attach yarn with sl st in st to left of any sc from last row. Ch 1 (does NOT count as beg sc), sc in same st, (ch 4, drop st from hk, pass hk through ch-4 lp of MC, pick up lp of CC, sk 2 sts, sc in st left of MC sc from last row) around, ending with ch 4, sk 2 sts, join with sl st to beg sc. Fasten off and weave in ends. NOTE: On Row 3 of edging, work sc under ch-4 lp of MC, work first ch around ch-4 lp. Refer to close-up picture of edging; I know this particular edging is a bit confusing at first, but once you figure it out, it becomes much easier.